Ziamond Cubic Zirconia CZ Jewelers welcomes Jamal Anderson to view the collection of gold and platinum jewelry. 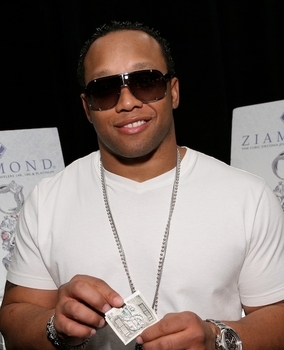 Jamal Anderson is holding his Ziamond Cubic Zirconia CZ Custom Money Clip in 14k white gold. All Ziamond cubic zirconia cz jewelry is available in 14k gold, 18k gold or platinum. Ziamond Cubic Zirconia CZ Jewelers offers an extensive collection of Men's jewelry.